Formulation: Enlivening mint and sage essential oils provide a long-lasting feeling of freshness. Sage and witch hazel extracts work to control odor caused by skin bacteria. Low alcohol formulation will not irritate skin or leave white stains. Tapioca starch helps absorb moisture. I don't wear anti perspirant or cologne and this deodorant helps me smell fresh. An effective and great deodorant. I was having a reaction to some solid deodorants recently ( natural as well) and needed to find one that agreed with my body. While I'm not a fan of roll-ons this one drys fairly quickly and is completely effective. I've had no reaction to it and I'm super happy! Love both of Hauschka’s deodorants. I have recently started using Dr. Hauschka skin care products (love them!) so I was excited to try this deodorant, not only because the skin care products have worked so well for me but because a friend raved about this deodorant. Unfortunately, for me, it did not work at all. I may have well been wearing nothing at all. I have gone back to using another aluminum-free deodorant stick which uses arrowroot powder (plus shea butter, essential oils, etc. ), which I find works better for me. I really wanted to like this product but I can't say anything good about how it worked for me, except that I liked the scent. Perhaps this product works well for those with a different body chemistry from mine. Hi, thank you for taking the time to share your thoughts with us. We are grateful that you love our products and are sorry the deodorant did not work for you. We appreciate your feedback. Love using the Sage Mint Deodorant!! Have used for years and it is the only one that actually works for me! NO junk in it either. Love it! Thank you! It's great to have a natural version of deodorant. It works well and I love the scent! Wont last at temps over 85 but then not much will. I love the sage smell and thought of using such a purifying plant. this is the only deodorant i like the most!! On a quest for natural deodorant. Getting healthy This one works better for me than the rose. The rose smells pretty but I have to reapply it midday. This one works all day provided not nervous. I reapply it if exercising. I even bought a bottle for my father and he uses it. Bye, bye, aluminum. Hello, memory. Long lasting, effective, great refreshing scent. Ordered 2 at the first purchase and will be purchasing more for family as gifts. Works great. Kinda smells like a mojito to me for some odd reason... smells great! Really works and last for a good while. This is a must have deo. If you re looking to be good to your body and stop using all these chemical filled deodorants but you want to make sure it works and that you dont smell=then try this! My husband and i are so pleased with it. I love this deodorant. It works well, has excellent ingredients, a good scent and lasts a long time - you don't need to use a lot. I have used it for several days only. It protects from sweat very well. I can not beleive it yet. I have used strong antiperspirants for many years. I was very disappointed I had to reapply after several hours. I think secret works better. Best Deodorant Ive Ever Used!!!!! Great smell! Great protection! Aluminum free! what more could you want from a deodorant? This deodorant is good. It's a bit pricey. I love the deodorant and would buy again. I have been using this deodorant now for 6 months. Whenever I have tried a new deodorant it takes at least a month for your body to adjust. I have also noticed it depends what fabric your shirt is that you are wearing. With synthetic blend blouses you do get some sort of odor, but I find this to be true with any deodorant you use. Overall I am pleased with this deodorant and have suggested it numerous times. When I find it on sale I stock up! If you are looking for a natural product I highly recommend!!! Like others, I've hesitated buying because of the price. I decided to buy it for my teenage daughter as a Christmas stocking stuffer. Now I've purchased another one for myself. We have tried every natural deodorant out there and the only one that worked at all was the crystal rock deodorant. Then I found out that it is actually not aluminum free (contains a different type of aluminum) so I kept trying different ones. This deodorant WORKS and really is good for you. If it can work for a teenager, it will work for everyone! It's worth the money. I showered dried myself and placed under my arms as I had lumps so this came recommended I went out for dinner but by themail time I walked down sat at the table is got this horrendous smell I had no idea where it was coming from. Until my face lit up to realise it was myself I had to leave the restaurant and go back and shower again then my husband used it the next day to prove me wrong he was back home in one hour it was disgusting. I give 100% to all your other products but this does not work. I read multiple reviews before buying the Sage Mint Deodorant. Since the reviews were mixed and all women body are not created equal, I decided to give a try; hoping it would work me for....and it did not. I'm 45 years old. I work in an office environment and sit 11 hrs/day (that include my daily commute). Therefore, I don't to any kind of exercise that requires a strong protection. I practically breath if I compare myself with some active women. Well, surely enough after applying the deodorant, I could smell myself after 3-4 hours. Not fun for self-confidence. I still haven't finished the bottle and use it only when I stay home. The smell is refreshing and dry almost instantly. It's a very expensive product and my faith Dr. Hauschka's brand and my desire to stay away from synthetic products compelled me to try. However, I recommend any dissatisfied client should get a credit. I always wanted to try a more natural deodorant that didn't irritate my skin but feared it wouldn't work, but after giving the sage mint deodorant a try, I'm a believer. More natural deodorant can and does work. Plus it smells just as good as all the other Dr. Hauschka products I love. This deodorant is working great. Smells good. Wonderful scent, great for sensitive skin that is prone to allergic dermatitis. This is the best deodorant product I have used. I am glad I discovered it and will definitely purchase again. Lasts up to 9 hours; no need to reapply. Just make sure the axilla is clean and dry before application. Also, let the deodorant dry completely after applying and before putting on clothing. I purchased this because reviews said it worked well for bad underarm odor. Although it smells nice it does not work for long. Within 4 hours I noticed underarm odor. I am dissapointed, I hoped I had found something good. My search for a deodorant is over. I have reordered the second bottle already. New formula really works (even in California). I really like this deodorant thus far! Works great, love the scent, and most importantly it lasts for my entire 12 hour (very physically demanding) shifts at work! It's summer and it works. Nuf said. Love it. My daughter and I use this deodorant and we love it. I got this for my 84 year old mother. Ill never buy anything else for her. Shes tried other natural deodorants..... nothing ever worked .. espically in those hot summer months... but THIS stuff works.... its fantastic. I bought this after reading reviews that it is a natural deodorant that actually works. It's expensive but it looks like it will last a while. I would highly recommend this product. This deodorant works extremely well....my only disappointment is that it contains synthetic fragrance(s). I'd be delighted if it was reformulated with only natural ingredients...which is what I thought it would be from what I had read about the product. Hi Ellen. Thank you for taking the time to write us a review. 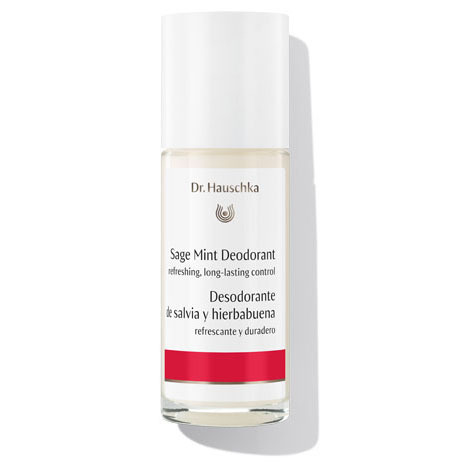 I do want to point out that this deodorant, like all Dr. Hauschka Skin Care products, is formulated with fragrance from 100% natural, pure essential oils. We never use synthetic fragrances, preservatives or any other ingredients in our products and never have. Our products are all 100% certified natural by NATRUE, whose criteria for natural certification is very stringent. You can learn more about our natural certification in Our Ingredient section. If you ever have a question about a product or ingredient, please don't hesitate to contact us at 1-800-247-9907 or email info@drhauschka.com. Thank you. 100 degrees, humid, running after a toddler, still carrying the "baby weight", a restaurant GM and I give this product 5 stars. Enough said! It smells great! It feels like I'm putting moisturizer on instead of deodorant. I do feel that I need to add some more if I'm pulling a late night but otherwise it's beyond perfect. To actually smell fresh, rather than the usual odd powdery chemical smell most deodorants have is fantastic!!! It left no stains on my clothing and dried pretty quickly. I am highly recommending to friends. Thank you!!!!! I work 10 hour shifts and hit the gym afterwards and it stood up to the test. The smell did fade, but there was no unpleasantness. It is still not perfection but sure is close. Apply deodorant to the underarms using a gentle back and forth motion. Repeat application as needed. Silk Body Powder maintains the skin’s healthy pH balance and absorbs perspiration, naturally helping to neutralize odors. Lemon Lemongrass Vitalizing Body Wash tones and refreshes skin with a soap-free formulation. Can be used as a shaving cream for legs and underarms.